This traditional ottoman is a great piece to add to your living room when paired with a traditional style chair. 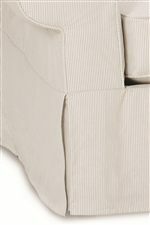 Rectangular in shape this piece is far from boring with options for customization with fabric choices, contrasting welt cord trim as well as nailhead trim in either brass or pewter. Create a piece that is a direct reflection of your fun and unique personality with this traditional ottoman. The Morgan Traditional Ottoman with Small Tapered Wood Legs by Rowe at AHFA in the area. Product availability may vary. Contact us for the most current availability on this product. Leg or Skirt Tapered wood block legs or skirted options. Wood & Finish Leg finish options are Espresso, Chestnut, Washed Pine, Americana, Chocolate, Latte, Pebble, Pearl. If finish is not specified, the most popular finish, Espresso will be selected. The Morgan collection brings you stylish furniture for your fashionable home. Comfort and quality in the cushioned seats and the steel spring system means these pieces are long lasting and help create the ideal spot to relax in your home. Sectional modular pieces allow you to create a piece that is perfect for gathering with friends or family and will transform a large family or living room. Sofas, chair and ottoman sets and swivel chairs bring smaller updates to your home while the many fabric options let you create a piece that is truly unique to you and your home. 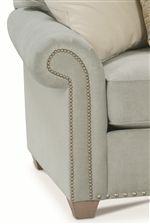 Other custom options include nailhead trim in brass or pewter as well as contrast welt trim, fringe and throw pillows. Together you can create a piece that is exactly what you have been searching for to create a space you are proud of in your home. The Morgan collection is a great option if you are looking for furniture in the area. Browse other items in the Morgan collection from AHFA in the area.